Spend your North Myrtle Beach vacation overlooking the pristine salt marsh channel in the Cherry Grove section of North Myrtle Beach, South Carolina. Marsh Haven is indeed a haven, especially for those who love bird watching, kayaking and fishing the still waters of an inlet. Marsh Haven is a third-row North Myrtle Beach resort with views of the salt marsh channel. This North Myrtle Beach resort is just across the street from the Atlantic Ocean and white sandy beaches. It is situated right along 60th Avenue North in Cherry Grove and has a dock that leads down to the salt marsh channel. Make reservations for Marsh Haven and enjoy a nicely furnished two-bedroom North Myrtle Beach vacation rental. This three-story North Myrtle Beach resort has a small number of North Myrtle Beach condominiums so you can expect quiet accommodations at this waterfront retreat. Marsh Haven is built on stilts so there is covered parking on the ground level. The North Myrtle Beach vacation rentals at Marsh Haven each have a balcony. Take it easy in a chair on your balcony and watch the tide ebb and flow in the channel. 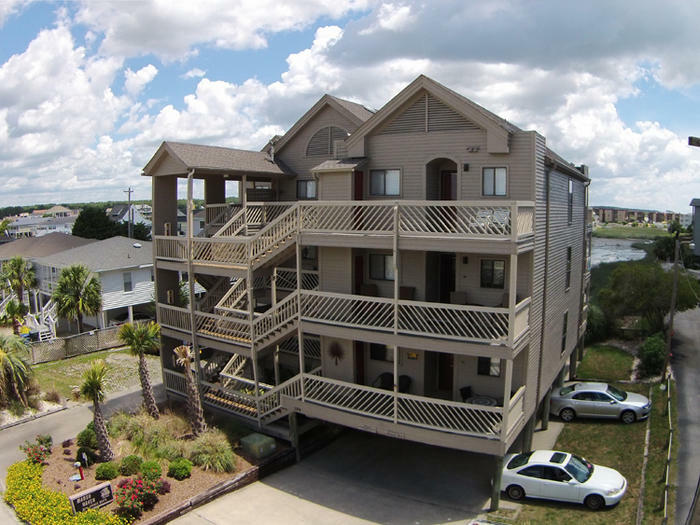 There are stairs on the front and back of this North Myrtle Beach resort that lead to the first, second and third levels of the Myrtle Beach condominiums at Marsh Haven. This is a charming North Myrtle Beach resort with a quaint waterfront ambiance, yet it is close to so much activity and a long list of North Myrtle Beach amusements and attractions. The two-bedroom North Myrtle Beach vacation rentals at Marsh Haven have two baths. There is a well equipped kitchen that comes complete with cookware, dishes and utensils. Keep your drinks icy cold in the full-size refrigerator of your North Myrtle Beach condo’s kitchen. Take advantage of the microwave and stove to reheat leftovers or make delicious snacks and a hot breakfast for your family each morning of your North Myrtle Beach vacation. The living room and dining area in each of these condos in North Myrtle Beach, South Carolina is comfortably furnished. There is a dishwasher in the kitchen for your utmost convenience. Up to eight people are accommodated in these two-bedroom North Myrtle Beach vacation rentals. Amenities inside these North Myrtle Beach condominium rentals include a DVD player, a television in each bedroom and a washing machine and clothes dryer. You are so closely located to the beaches of North Myrtle Beach, South Carolina that you can hear the waves and smell the salt air. Take your family outside for a cookout in the grill area provided at Marsh Haven. Sizzling steaks, juicy hamburgers or freshly caught fish are perfect entrees for the grill. Elliott Beach Rentals is not affiliated with onsite management or the HOA of Marsh Haven.